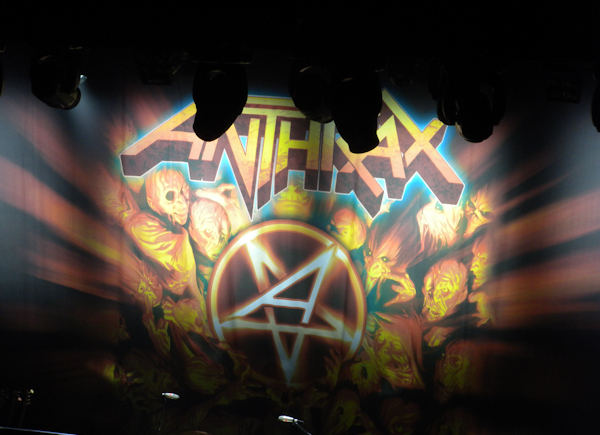 Ever since Angel and I have had our hands on Anthrax’s Worship Music album, we’ve been in love with it. When we heard that their supporting tour was coming to Club Nokia on October 22nd, we bought our tickets immediately. We waited with great anticipation for this day to arrive, and it was finally upon us! We arrived just in time to hear the last few songs of Death Angel. Admittedly, I haven’t heard much of their stuff, but they sounded really fantastic, and made a fan of me last night! 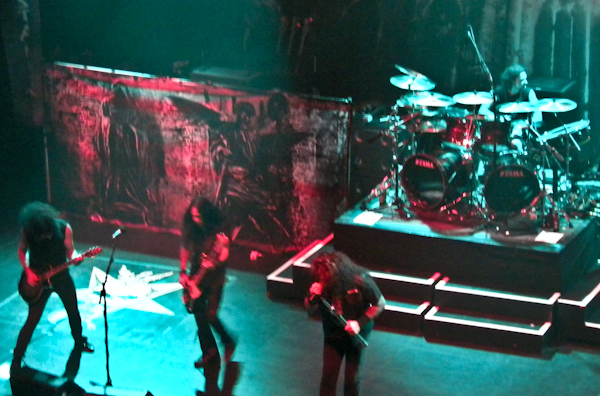 We took our seats, which were general admission, and waited for Testament to take the stage. The lights went down, and the mayhem began! They played some older songs that I recognized off of the The Legacy, The New Order, Practice What You Preach, Souls of Black, and The Ritual, and some stuff that I didn’t recognize at all, but that’s alllll right! They put on a great show and provided a great ambiance. A highlight of the evening was Testament presenting one lucky winner with an Eric Peterson Signature Dean Guitar! The winner looked absolutely ecstatic up there on stage receiving his prize. 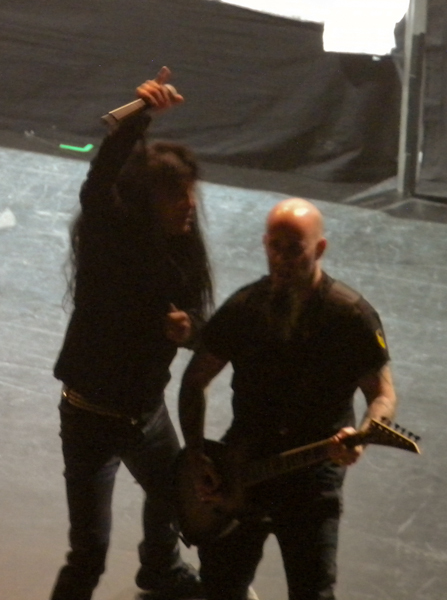 Shortly after Testament, Anthrax hit the stage, and Club Nokia blew up! 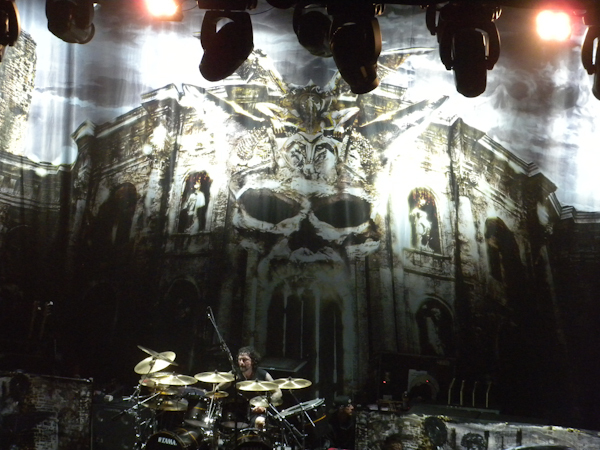 To my pleasant surprise, they played quite a few songs off the new album. The crowd didn’t seem to mind either – everybody was dancing and banging their heads. 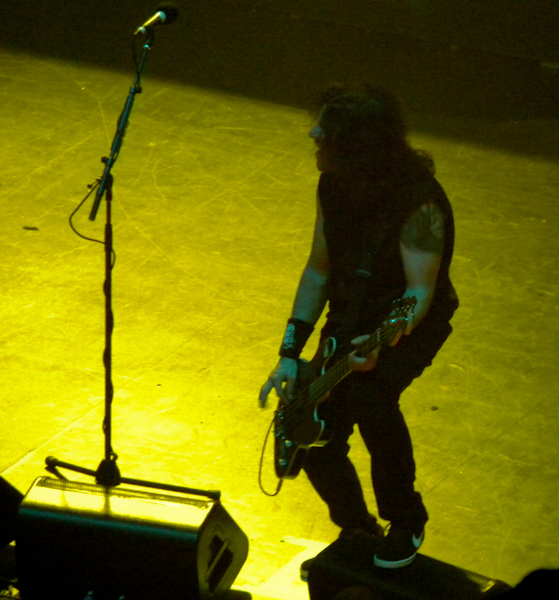 They also did some their classics – Got The Time, Indians, Caught In A Mosh, and Antisocial among others. 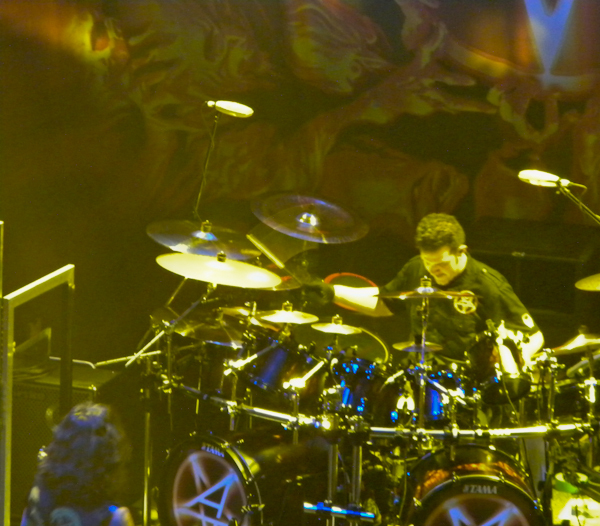 During their second to last song of the set, something a bit frightening occurred. 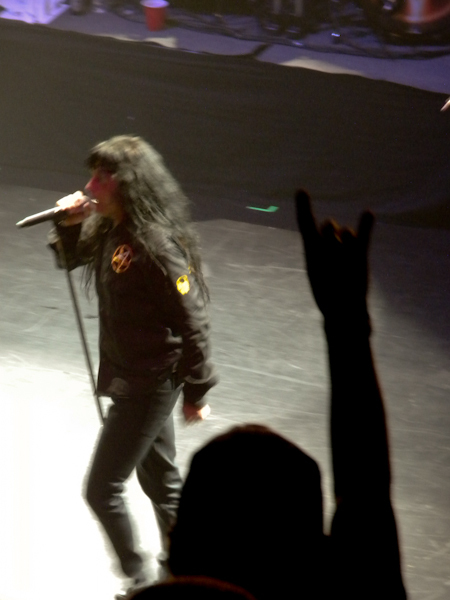 One overzealous fan weaseled through the security guards on the floor, and made it up on stage. 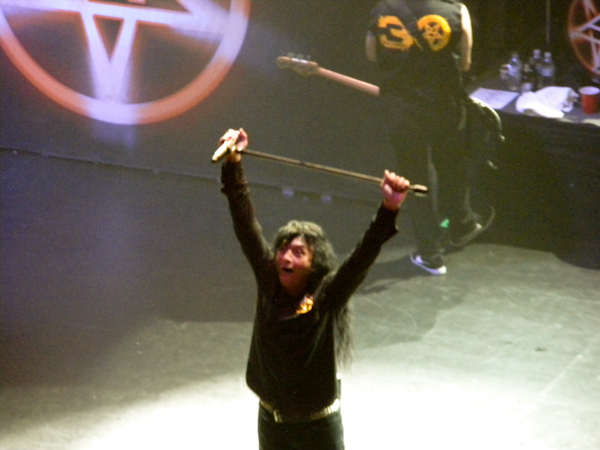 Joey Belladonna went to put his arm around the guy to sing and have a good time with him, but the security guards weren’t going to let that happen. I didn’t see this part with my own eyes, but my husband did – the security guard crawled up on stage and TACKLED THEM BOTH! I mean full-on tackle like a friggin football player, with feet leaving the ground and everything. My eyes caught the fiasco just as Frank Bello threw his guitar down, and dove on the dog pile, trying pull everyone off of each other. They recovered as gracefully as they could, and finished the set, but we couldn’t help but notice that Frank and Joey were hurting during that last song. 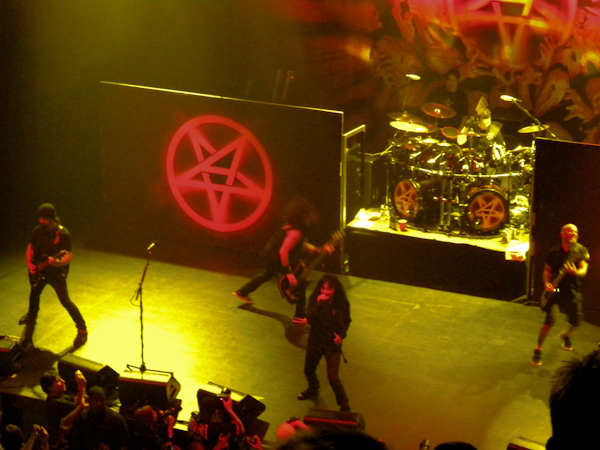 Overall, it was a fantastic show to go down in the history books of METAL! *Update! * – Another account of the tackle by Rock News Desk. This show has got to be up there as one of my favorites this year. 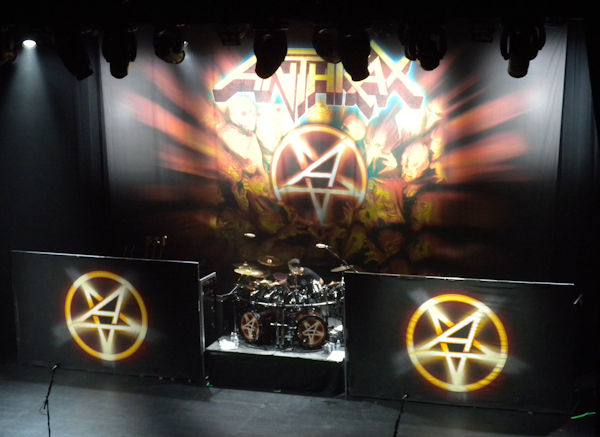 The Big Four back in April was cool and all, but I really do prefer smaller, more intimate venues like this one. The energy was just incredible, and you can’t really get that with big festivals. 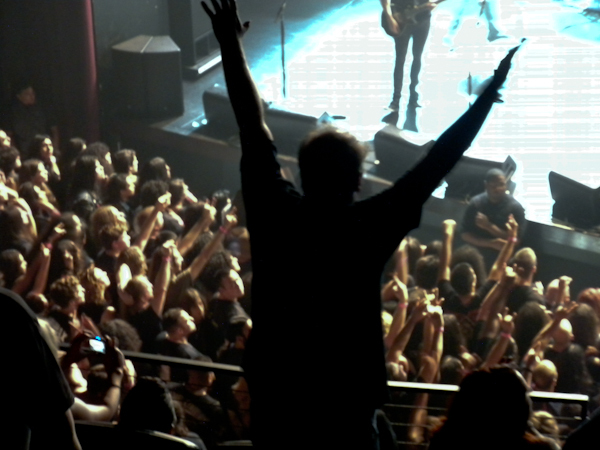 Do you have a favorite concert you’ve attended this year? 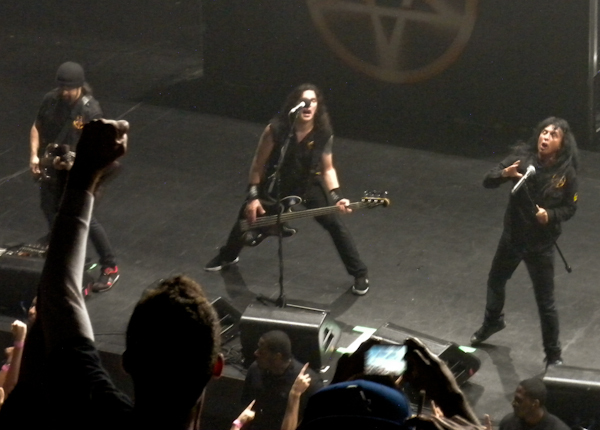 Amazing performances from Testament and AnthraX last night! I’ll never forget the tackle either. I enjoyed watching some of the video clips – that security guard must have been totally focused on the ‘crasher’. I was at Altamont years ago when the Hell’s Angel’s did the security with a tragic result. Things can get crazy & out of control real fast!